No obligation, no credit card. 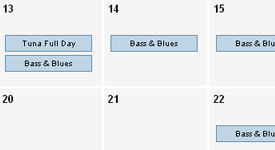 30-day free trial. Bass River Charters offers Cape Cod Sport Fishing for the energetic and dedicated fisherman, but would also like the opportunity to share our love of fishing to the beginner. We are centrally located in the Mid-Cape area, fishing out of Bass River, in South Yarmouth, MA adjacent to the bridge where Route 28 crosses the Bass River. Finally a professional resource for charter fishing captains and fishermen everywhere. Users, sign up for a free account. Captains, start selling more trips. 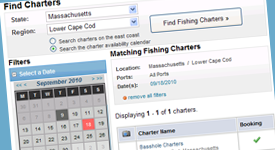 Search by state, region, date and more to find fishing charter availability in real time. You can then gather information including ratings of charters, captain logs, fishing reports, photo galleries, vessel info. 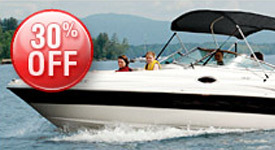 and more before you book your charter online. Add your chosen charter to your shopping cart along with any gear you might wish to purchase, and check out securely with your credit card... then be at the dock on time, its as easy as that! 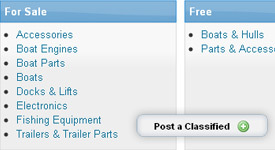 Post items for sale, or find your next boat or outboard. 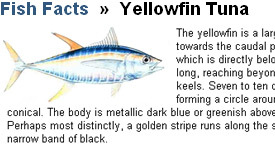 Find or post fishing tackle and supplies. Our classifieds are easy to post and easy to search, not unlike the Craigslist format you are already familiar with. View up-to-date reports in your area, or post a report about your own fishing trip... this is the place to share information about whether the bite is on in your area. Learn more about the species you've been catching; including habitat, diet, size, range. Feel free to send us information to make our species "wiki" more complete and more accurate. Photos are welcome too! Shop online for all your fishing needs. We've worked hard to provide you with the best selection and at prices you'll never match in your local tackle store... so shop with us before you get on the water, and save big! Also, pick up your AtlanticPanic gear here on our site, help us spread the word!! !